Now if only Samsung and T-Mo can get it together to get Froyo on the Vibrant... Sigh. Awesome news! This was the most important feature that was missing from my Android phone. Thank you Goooooogle!! You should mention this only supports one account at a time. I have both a personal Google account and a separate work Google account. The Android phone seamlessly lets you use both accounts. Google docs in the desktop browser also lets you switch between the accounts with a drop down. Sadly this mobile service is stuck with one account requiring you to repeatedly log out and back in again - a huge pain! what about functionality with webOS? Best thing ever! I've been waiting for this; it will definitely make my life easier. Thanks! We are now on the verge of some very cool things in the areas of mobile learning - thanks Google. google is always best and their features as well... these are real helpful. wow, this is incredible - to do real time editing on mobile phone. Hm, any idea if this will be rolled out to Google Apps users soon too? This is really great to see. Thank you, Google. But -- nested folders on Mobile Google Docs are still broken: there's just no way to see what subfolders are inside any folder. This is a really weird oversight/bug and incredibly frustrating: I've got thousands of docs organized into a complex directory structure, and without being able to see nested folders, I can't find anything in the current Google Docs site. Why build in so fundamental and frustrating a difference between the mobile and desktop sites? So -- I'm happy to see editing added. But it's not really useful for me because it's just too hard to find documents. Until this nested folder issue is addressed, I'll still have to depend on third party solutions (Docs to Go, QuickOffice, etc...) for dealing with my Google Docs. Does this not work on the iphone? I can't see an edit button when looking at a doc. And, as usual, no 1.6 support. Oh, well. Thank goodness for non-Google app developers! What about google apps (premier and paying) users? Left behind as usual? Will this support editing in the offline mode? I agree with Dan, editing is great but why can't we create a new doc? Btw, the Gdocs app for Android has made creating and editing Google docs for a while now. Nice to have it built in but until I can create a new doc I'm going to stick with the Gdocs app. I love you because you are thinking in the same way for android and iOS users. I am a happy Google Apps Premier Customer with many iPads, iPhone (and soon Android) users in my company and loving to work on the Go with your tools. An app that we could use offline would be better. Yes -- an app for offline use is what I've really been waiting for too. But in the mean time: thank you, Google. Nice to see editing enabled for mobile browsers. Why is this for Android 2.2 only??? I tried it on android 2.2 to edit a spreadsheet with simple arithmetic, such as addition. It allows to edit only those cells with just a number or data, no formulae, even as simple as a1+b1 is allowed to be modified. Why can I only edit some of my docs on the phone? My shopping list wasn't editable but a new doc I created was. I edited my shopping list with quick office and then it was editable in the mobile web. This trick doesn't work though for my work and personal scratch pad docs and many others. They just don't get an edit button on the mobile site. For months I wanted to edit some small details in a "spreadsheet" or in a text. And with openoffice or closeoffice was not possible from my mobile. Even with my phone that have proprietary software, I can edit. Hace meses que quería editar algunos pequeños detalles en una "hoja de cálculo" o en un texto. Y con openoffice o closeoffice no era posible desde mi móvil. Incluso con mi móvil que tiene software propietario, ahora puedo editarlos. I'm using apps for domains. Why no love? 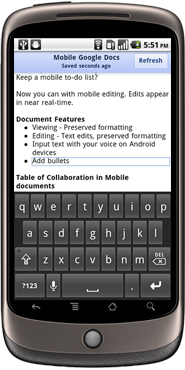 I'm glad that I can create a new Doc on my Palm Pre+ (webOS) but I'm hoping you will add editing to webOS. It's a webkit browser so it shouldn't be a big issue. Love Google's products and the more we can do mobile the better. Please support Opera Mobile on Android. I am unable to save changes to my documents, I get a server error each time I try! I can't imagine why people think this is a GOOD thing. Just one more way for bosses to chain employees to their e-mail 25 hours a day, 8 days a week. I can't even go to the "ball game" without working at the same time?!? I am vey disappointed about this option! You can only add plain text, you cannot change styles, in faxt it is completely useless. I really cannot see how people can be enthousiastic about this feature. It bring you back to the typewriter era. Why can't Google make the normal Docs functionality working on my IPad, instead of this? The first thing you should do when looking to hire a freelance iPhone developer is to outline what type of development you need done for the iPhone. What an ungrateful group we have here. I guess I should not be surprised. Thank you Google for allowing us to to CREATE and EDIT Google docs for FREE! This is not a great feature and I'm surprised that Google has not done a better job. They should be doing a iPad, iPhone and Android apps for this stuff until they can get it to work properly in the mobile browsers. This is really good, I've been using google docs for quite sometime now and has already proven to be useful. Why is there no support for BlackBerry Webkit browser? 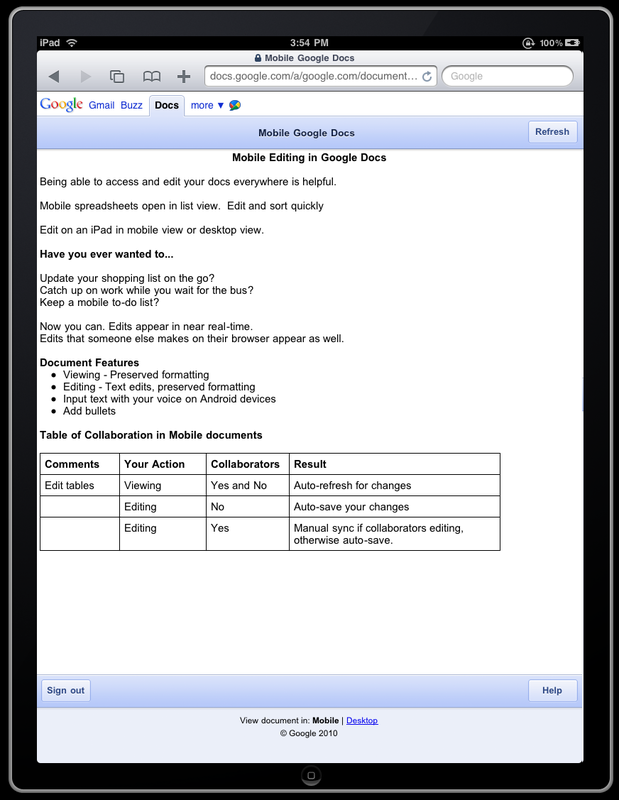 Editing your Google Docs on the go. Waiting, like many, on an Android app to access documents. A bit surprised that this is not native to Android. I am, however, glad that we are able to edit documents via internet. I am also glad this is even possible, consider I don't pay Google a dime (don't want to be ungrateful). ...And I mean a Google Official app. I do not know how much I trust third-party developers with so much of my info.